TRAI released their Telecom subscription report for the month of March 2015, and the upward growth of mobile subscribers continues – infact, it is now growing at much faster pace. In the month of March 2015, a total of 9.31 million new subscribers were added, highest in last 12 months. The total subscriber base has now reached 969.89 million, just 30 million short of 1 billion subscribers. In all probability, the magic 1 billion number should be reached in next 6 months. Interesting, the faster pace of growth is all attributed to rural subscriber additions. On contrary, Urban subscriber base actually fell by 1.56 million, while rural base grew by 10.88 million. Though rural tele-density is still one-third of urban, the scenario is changing quite fast. Here is how subscriber has grown over past 2 years. Active subscriber base means, the number of connections that have been active atleast once in a particular month, This number currently stands at 862.63 million which is 88.94% of total wireless subscriber base. The various steps taken by TRAI over the years to weed out inactive numbers from the system has proved effective and results are there to see. In last 18 months, active base has grown by whopping 5 percentage points. – With an increase of 9.31 mln in March 2015, total mobile subscriber base has reached to 969.89 million. 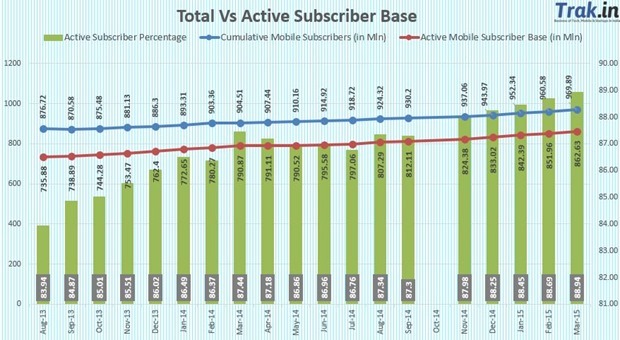 India had 960.58 million subscribers by end of Feb 2015. 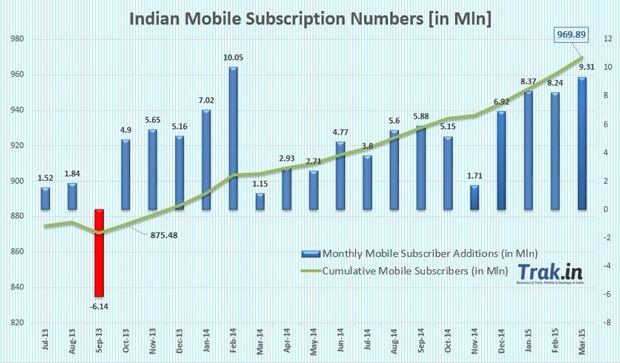 – Urban India witnessed a monthly decrease of 0.28 percent or –1.56 mln subscribers, while rural mobile subscriber base increased significantly by 2.70 percent or 10.88 mln. – Urban India has a total of 555.71 million, while rural India has a total of 414.18 million mobile subscribers. – Urban Teledensity decreased to 143.08 from 143.71 in March 15, while the rural tele-density increased to 47.78 from previous 46.56. 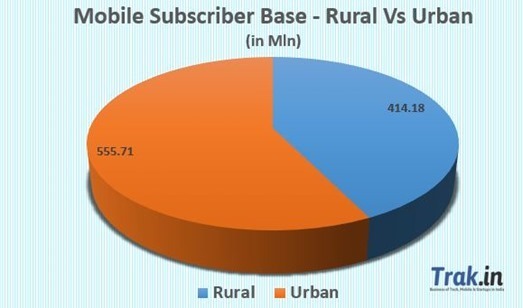 – Urban mobile subscriber share stands at 57.30% as compared 42.70% of rural subscribers. – 3.84 million new Mobile portability requests were made in month of March 2015, taking the total tally of MNP requests since launch to 153.85mln. – Active Mobile Subscriber base increased from 851.96 mln in Feb 2015 to 862.63 million in March 2015, taking the active percentage to 88.94 percent. Bharti Airtel and Idea Cellular have both been doing exceedingly well over past few months and both added over 2 million subscribers. Reliance Communication has picked up steam in last 2 months and have added 1.6 million new subscribers to their kitty, third highest of all operators. BSNL has had a dreadful time over past year – and they have lost close to 18 million subscribers in last 12 months. Infact since March 2014, they have not had a single month with positive growth. On the other hand, Tata who had picked up subscriber base in last couple of months witnessed negative growth yet again in month of March. 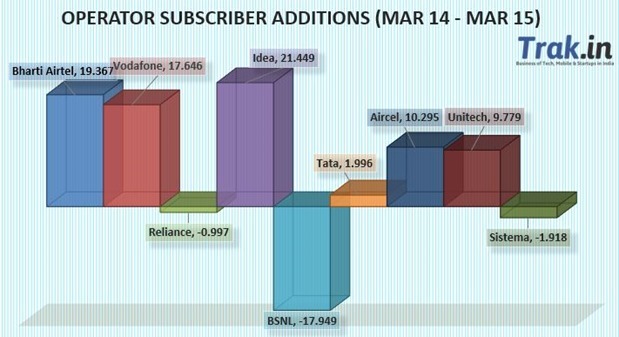 Among smaller operators, Videocon and Aircel are steadily adding good number of subscribers! 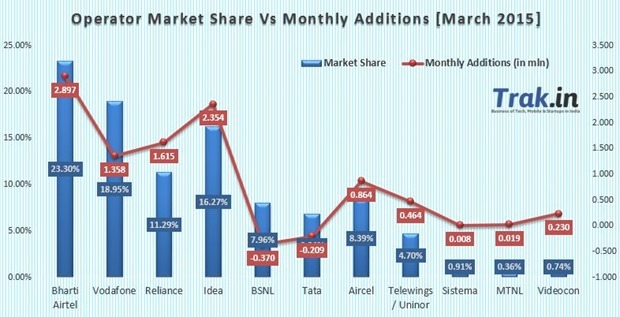 Along with BSNL, Reliance and Sistema are two other operators who have lesser subscribers that they had a year back. Here is how various operators have fared over last 12 months.